John of Damascus, St. The last but one of the Fathers of the Greek Church, and the greatest of her poets (Neale). He was of a good family in Damascus, and educated by the elder Cosmas in company with his foster-brother Cosmas the Melodist (q. v.). He held some office under the Caliph. He afterwards retired to the laura of St. Sabas, near Jerusalem, along with his foster-brother. There he composed his theological works and his hymns. He was ordained priest of the church of Jerusalem late in life. He lived to extreme old age, dying on the 4th December, the day on which he is commemorated in the Greek calendar, either in his 84th or 100th year (circa 780). He was called, for some unknown reason, Mansur, by his enemies. His fame as a theologian rests on his work, the first part of which consists of philosophical summaries, the second dealing with heresies, and the third giving an account of the orthodox faith. His three orations in favour of the Icons, from which he obtained the name of Chrysorrhous and The Doctor of Christian Art, are very celebrated. The arrangement of the Octoechusin accordance with the Eight Tones was his work, and it originally contained no other Canons than his. His Canons on the great Festivals are his highest achievements. In addition to his influence on the form and music, Cardinal Pitra attributes to him the doctrinal character of the later Greek hymnody. He calls him the Thomas Aquinas of the East. The great subject round which his hymns are grouped is The Incarnation, developed in the whole earthly career of the Saviour. In the legendary life of the saint the Blessed Virgin Mary is introduced as predicting this work: the hymns of John of Damascus should eclipse the Song of Moses, rival the cherubim, and range all the churches, as maidens beating their tambours, round their mother Jerusalem (Pitra, Hymn. Grecque, p. 33). The legend illustrates not only the dogmatic cast of the hymns, but the introduction of the Theotokion and Staurotheotokion, which becomes the prevalent close of the Odes from the days of St. John of Damascus: the Virgin Mother presides over all. The Canons found under the name of John Arklas (one of which is the Iambic Canon at Pentecost) are usually attributed to St. John of Damascus, and also those under the name of John the Monk. Some doubt, however, attaches to the latter, because they are founded on older rhythmical models which is not the case with those bearing the name of the Damascene, and they are not mentioned in the ancient Greek commentaries on his hymns. One of these is the Iambic Canon for Christmas. His numerous works, both in prose and verse, were published by Le Quien, 1712; and a reprint of the same with additions by Migne, Paris, 1864. Most of his poetical writings are contained in the latter, vol. iii. pp. 817-856, containing those under the title Carmina; and vol. iii. pp. 1364-1408, the Hymni. His Canon of SS. Peter & Paul is in Hymnographie Grecque, by Cardinal Pitra, 1867. They are also found scattered throughout the Service Books of the Greek Church, and include Iambic Canons on the Birth of Christ, the Epiphany, and on Pentecost; Canons on Easter, Ascension, the Transfiguration, the Annunciation, and SS. Peter & Paul: and numerous Idiomela. In addition, Cardinal Mai found a manuscript in the Vatican and published the same in his Spicilegium Romanum, which contained six additional Canons, viz. : In St. Basilium; In St. Chrysostomum; In St. Nicolaum; In St. Petrum; In St. Georgium, and In St. Blasium. But M. Christ has urged grave objections to the ascription of these to St. John of Damascus (Anthologia Graeca Carminum Christorium, p. xlvii.). Daniel's extracts in his Thesaurus Hymnologicus, vol. iii. pp. 80, 97, extend to six pieces. Dr. Neale's translations of portions of these works are well known. Saint John of Damascus (Medieval Greek Ἰωάννης ὁ Δαμασκηνός, Ioánnis o Damaskinós, Byzantine Greek pronunciation: [ioˈanis o ðamasciˈnos]; Latin: Ioannes Damascenus); also known as John Damascene and as Χρυσορρόας / Chrysorrhoas (literally "streaming with gold"—i.e., "the golden speaker"; c. 675 or 676 – 4 December 749) was a Syrian monk and priest. 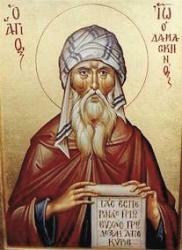 Born and raised in Damascus, he died at his monastery, Mar Saba, near Jerusalem.